Warming up with finger exercises is an important part of playing and performing with your ‘ukulele. It gets the muscles in your fingers active so that you can play better and with less physical effort. Jumping into a hard song “cold” is always going to be a rough ride, but get your hands warmed up beforehand and your performance will be much more relaxed and natural. Here are some warm-up ‘ukulele exercises to get those fingers flyin’. If you are only going to do one exercise to prepare for playing ‘ukulele, I would recommend stretching. It loosens up your hands and tells the muscles, “Hey, physical exertion coming up!” This will help you avoid becoming sore and hopefully reduce your chances of developing carpal tunnel syndrome. 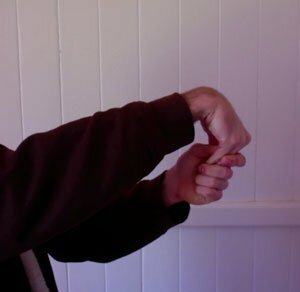 Hold one of your arms straight out in front of you with your fingers pointing to the sky, 90 degrees to your arm, in a “stop” position. Take your other hand and pull the tips of the fingers towards you so that you feel a stretch. You should feel it in your wrist and the bottom of your arm. Good stretching practice is to hold for 15-20 seconds and never stretch to where it hurts – only to the feel-good point. You can also exercise your hand by stretching in the reverse direction, holding out your arm and letting your hand droop down towards the floor. Then reach under with your other hand and pull on the fingers towards you for a soft stretch. You should feel the stretch in the top of your arm. Hold your arm out in front again, this time with your thumb pointing towards the sky with your fingers curled in a fit – “thumbs up.” Pull the tip of your thumb towards you to the “feel good” point. You should feel this stretch in the base of your thumb. The following is a collection of finger exercises intended to build dexterity and prepare your hands for playing. Do each slowly until it becomes natural. If you can’t play it perfectly all the way through, go slower. Rushing and playing sloppy isn’t going to calibrate your hand/mind relationship for the better and makes it useless as a warmup. If you struggle with timing then get out your metronome and play one note per click (or two or three or four per click). The goal is quality, not quantity. Speed will come with time if you work at getting your fingers coordinated first. Here is a tab of the examples. More detailed directions are provided below. 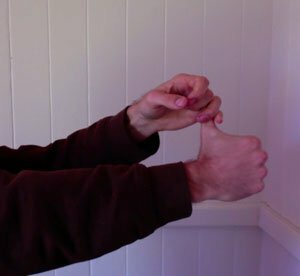 As simple as it is useful, the almost-chromatic ‘ukulele exercise is a great warmup to get your fretting and picking hands synced together. Since it strays from being an exact chromatic scale (some notes are doubled), I call it the “almost” chromatic scale. With this one, the rule is: one finger per fret. Your 1st finger plays the first fret, 2nd finger plays the second fret, 3rd finger plays the third fret, and 4th finger plays the fourth fret. Then you switch strings and start over. Start on the G or A strings and work your way across the fretboard. You can either start on an open string or start on the 1st fret. Keeping all previous fingers down on the fretboard – for instance, once you put your 1st finger down, leave it in place as the 2nd finger plays. Lifting each finger after it does its job. Shift the finger off of each fret as you go so it’s more like “tippy-toing” across the fretboard. Hard chord changes are a fantastic way to get your fingers in shape. They are also useful for teaching those fingers how better to locate themselves to each other – the key to fast chord changes. Joe’s chord relay is made up of two chords. They aren’t terribly hard to play by themselves, but when you put them back to back the hand positions will make you sweat! It’s basically two diagonal lines across the fretboard – first one way, then the other. To get your fingers accustomed to variations in fret spacing you should practice this high up the fretboard. “I used to tell my students ‘strum, mute, switch’ when they were doing this – the idea being that after you strum the first chord, your strumming hand mutes the strings before you lift your fretting fingers and switch to the next chord” ~ Joe Satriani in Guitar Player Magazine, February 2008. By mixing the two previous exercises together you can get a cool hybrid warmup that covers the first four frets and all four strings. Start with a snippet of the almost-chromatic warmup on the G-string, then fret the second shape of the chord relay and arpeggiate down the strings. Once at the bottom, walk chromatically up to the 4th fret and then descend toward the ceiling with the first chord shape. Repeat in an endless loop or reverse to practice moving your fingers in the opposite direction. I like this one because it actually sounds like something close to music. The idea is that you take the C major scale, play it open, then move the shape up one fret so that your index finger works as the “nut”, and move it up again, and again… Once you run out of fretboard you can work your way back down. As you improve at this you will get faster and it works as a speed exercise too. 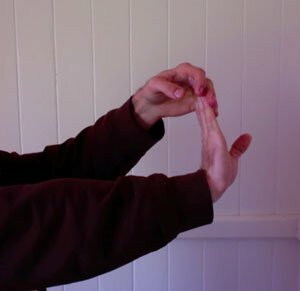 A way to change this ‘ukulele exercise up and make it harder is to use alternating fingers to pick: thumb, index, thumb, index – all the way through. Aldrine and Co. at Ukulele Underground covered a great alternative to this plain scale where you skip around by sequencing the notes.